Although Marco Antonio Spaventi has been building up a steady rate of releases for the past few years, both under his own name and with his R-A-G and Crystal Maze partners, that’s probably just a very small percentage of the records that have borne his touch. In his capacity as an engineer and professional producer he has lent his expertise to a huge number of artists, helping the records of people like Terrence Dixon, Conforce, Tom Trago, Delta Funktionen, Juju & Jordash, John Beltran, John Heckle and Gerry Read sound as good as they do. First appearing alongside friends Aroy Dee and Gijs Poortman as R-A-G midway through 2010, the Beyond EP and its solid framework of deep, analogue techno were just a hint of what was to come. As the trio continued to produce equally vital EPs for Dee’s M>O>S label, Spaventi was beginning to release his solo material and also collaborate with Poortman as Crystal Maze, whose more refined sound could be fairly likened to R-A-G on high polish. His first truly solo output was an enjoyable, if not slightly atypical release (when weighed in against the rest of his work), which found the Italian in heavy Italo-disco mode. After a couple of collaborations with James Priestly, we heard from Spaventi on his own again and this time he was wringing out every last bit of grit from his hardware. His aptly named “The Jungle/Insanity” was an unrelenting call to action for those who hadn’t yet made his acquaintance, and the “Lonely” capped 2013 in fine style. With Spaventi in demand both as a producer in his own right and an engineer, LWE managed to pop some questions to him as he made his way to a rather prestigious awards show. His exclusive mix takes in classic, freshly minted, and unreleased techno, making the 191st in our series just as crucial as his impressive discography. Hi Marco. How has 2014 been treating you so far? Marco Antonio Spaventi: So far has been already exciting! I upgraded my mastering/production studio with a really high quality signal path, a pristine sounding Crane Song Avocet and a pair of really nice PMC speakers. Plus I have had to travel for work, so I am now currently in L.A. and I am about to go to the Grammy awards! So your first release under your own name was a two-track Italo disco affair with a couple of remixes. From there you focussed on your collaborative projects until starting to release more of your solo things about a year ago. Why were your own productions put on hold? Was it more fun making music with other people? It is fun to make music with other people but mostly it is a matter of time and simply creativity flow. What comes out better in that period, goes out. Also, making music with other people increases your skills and makes you more focused next time you make music on your own. And besides that, I went on producing on my own indeed; simply stuff didn’t come out and it’s coming out more now, bit by bit. Between your own work and the Crystal Maze and R-A-G releases you have a good number of records out, but most of your work is behind the scenes. Can you tell us what first got you into studying electronic music and how that lead to where you are today? After taking a degree in electronics I left Rome to go to Amsterdam, to further specialize in sound engineering. That was always my passion, along with the artistic side of being a musician and producing music. So I am lucky to be able to combine both things and support myself with it! What made you decide to move to the Netherlands? Was it a music-based decision? Your list of clients is like a who’s who of techno and house music, but I see you have had some corporate clients as well. What have you done for companies like Comedy Central and Pepsi? I currently work as a mix and recording engineer for Comedy Central, and for Pepsi I did a specialized course about Ableton Live (the same reason why I am in L.A. now, to record some videos for an SAE on-line course). It must be really interesting being able to really delve into the productions of your contemporaries and dissect what they’re doing with their sound and where they want to take it. That must lead to a lot of ideas for your own work too. Yes! Working on other people productions and also be a teacher is a continuous source of inspiration to me! Although you must work across a number of different platforms and with all kinds of equipment for your teaching job and your other work, do you have a preferred studio setup that you apply to making your own tracks and those with the guys as Crystal Maze and R-A-G? Oh yeah, nothing comes out if I don’t have the Roland drums next to me! And also some knobs to tweak. But naturally also some sort of computer rig to be able to record, possibly multi-track, edit and remix the stuff! With R-A-G it is real fun because in my studio there is enough space and knobs to tweak, that each one of us has a different function, so the product that comes out is really like a band playing. With CM it is different; there we go much more into details, sound design, brain storming each time to create the perfect track. On my own it is a combination of both, but indeed there are a few pieces I use always, the 808/909 the Prophet 5, the SH101 and the Moogs. Working on so many different people’s music, do you find there are universal things that people tend to overlook or get wrong in their productions or mixing? Yes often the low end and is problematic, and also, being a mastering engineer, how people often deliver really compressed material. It’s almost impossible to work with. Are you still teaching courses? How can people find out about them? Oh yeah, I still teach for SAE Amsterdam regularly, but I stopped with private classes because I am too busy with the rest. Given that Gijs (G-String) is in both Crystal Maze and R-A-G, do the two of you try to set apart the sound that you make with Aroy as R-A-G, or is that just something that happens naturally? It happens quite naturally, R-A-G is more a jacking, fun affair that pretty much is about getting together, drinking beers, jam forever and then wrap it up and edit (then I usually take it on my own to mix it and master it). Crystal Maze is the deeper side. Or maybe sometimes I start something and we finish it with G Strings so it becomes a Crystal Maze track. Can you foresee an R-A-G or a solo Ma Spaventi album any time soon? Yes, stuff is boiling and tracks are accumulating so probably there will be a Spaventi solo album on M>O>S this year! What can you tell us about the mix you put together for us? It’s a combination of old and new, some unreleased stuff and some real classics. Some from me and some from friends and artists I respect a lot. To keep the mood I recorded it only late night, so defo it’s a deep, late night affair. Exactly how I like it, I hope you guys enjoy it! And what can we expect from Ma Spaventi, R-A-G and Crystal Maze over the next year? A lot! We have a new R-A-G just out, a Crystal Maze coming out next month, another Crystal Maze 85% done. Some secret stuff which just came out (I am sure you guys with good ears will recognize it :p). 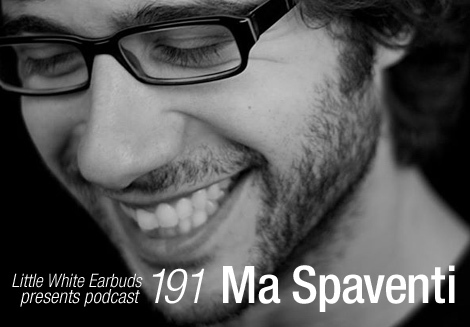 Then there is a Ma Spaventi coming out also next month on Slow Motion Records, for which I am really excited! It really is my musician side; something in between wave and deep emotional stuff. Then I have an album of more soundtrack stuff pretty much ready and waiting to come out in Italy. Then, of course, who knows what will be next? Jack-fun Italo or soundtrack styles? I gotta say thank you very much for your invitation to participate in LWE! Respect.